OK then, without too much of a preamble, the latest batch of reviews. Again, I've been a bit busy of late, so I'm going to try and keep these short and sweet. In a summer with many so-so superhero movies, here's another... so-so superhero movie. Chris Evans plays Steve Rogers, a frail and sickly young man, whose desire to join the army and fight in the Second World War is thwarted by his poor physical condition. Steve agrees to be the human guinea pig for an experimental new treatment, which turns him into a fine physical specimen, ready to serve his country. 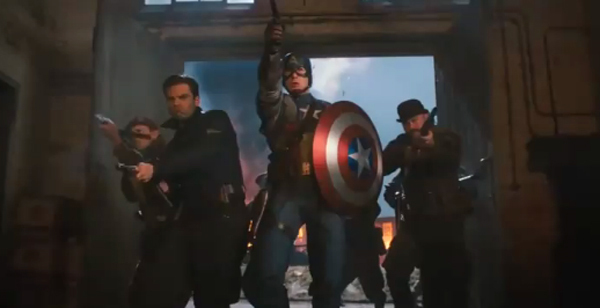 Unfortunately, the scientist responsible for developing the super serum is assassinated by a Nazi spy before other soldiers can receive the same treatment, leaving Captain America as the only one of his kind. The Captain heads off to Europe, initially as part of a propaganda exercise, but is soon forced to do battle with a renegade Nazi general known (for obvious reasons) as the Red Skull. I have to say that the film was fairly enjoyable and passed the time well enough, but it wasn't anything too special. Hayley Atwell was suitably fesity as the British secret agent who served as the Captain's love interest, and Hugo Weaving was also pretty solid as the villainous Red Skull. How does it compare with Thor and X Men: First Class? Well, I suppose it was actually a little better than either of those two movies, but I doubt it's a film I'm going to return to in the future. Perhaps I should go and see Green Lantern, so the above films all look good in comparison. I can't really comment on this movie particularly thoroughly, as I was (half) watching it with a couple of friends while eating my dinner and having a few drinks. From what I saw of it, the film was... not too bad. Michael J Fox stars as a moody adolescent, whose life is further complicated by the fact that he has inherited a werewolfism (or werewolfitis, or whatever the correct term is) from his father. 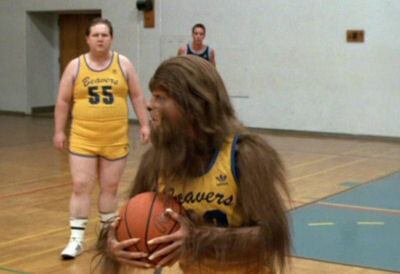 Unlike most other movies in the werewolf genre, Fox seems to be able to control his ability to change form - and when he is in the form of a werewolf, he seems less interested in seeking out human flesh and more interested in playing basketball. Indeed, he discovers that being a werewolf has some notable advantages; it improves your athletic ability and gets '80s girls with big pouffy hair to notice you. There were a few laughs here and there, but the whole thing's very slight. I should also point out that this film features some of the oldest looking 'high school students' ever seen on film. The guy who plays 'Fatty' (pictured below) looks like he's in his late 30s. A film for Michael J Fox fans only. I am not what you would call 'an Adam Sandler fan', which is probably apparent from my review of his supposedly serious movie Funny People. I think you could count on the fingers of three fingers those films of his which I've actually enjoyed (for the record: Happy Gilmore, Punch Drunk Love, and this one. I suppose The Waterboy wasn't too bad either). Still, this is a film of his which I can get behind. Some classic '80s tunes, an engaging plot, and - shock horror - Adam Sandler actually being funny, I've seen the Wedding Singer about three or four times, and it's still really good. I should also point out two brilliant, scene stealing turns from Steve Buscemi (as the angry, drunken brother of the groom at a wedding early on in the film) and Jon Lovitz (as a sleazy singer). Almost good enough to make up for 'Click'. (Though probably not good enough to make up for the likes of Grown Ups and all those Rob Schneider films he helped to produce). In which a predatory thirty something photographer (Patrick Wilson) lures a fourteen year old girl (Ellen Page) back to his house, following a meeting at a coffee shop. Little does he know that she is far from the innocent that she appears to be; has been tracking his activities for some time, and is about to turn the tables on him... I didn't really know what to make of this film - to give too much away of the plot would mean giving away spoilers - but without going into specifics, I didn't think much of the ending, which took away any kind of nuance from proceedings, and made everything a little too black and white for my liking. Both Page and Wilson are very solid, but the script seems rather clunky at times, which reduces the impact of their performances. The film also revels in the torture being meted out by Page's character, and some of those scenes were a little hard to stomach. 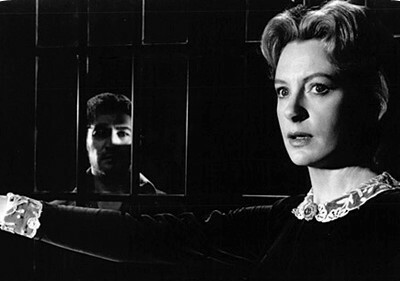 Classic '60s horror, based on Henry James' novel 'The Turn of the Screw'. A new governess (played by Deborah Kerr) moves into a beautiful but eerily quiet country house to take care of two orphaned children. However, despite the children's initially charming behaviour, the governess becomes convinced that the children have been possessed by the spirits of two former employees who formerly worked at the estate, and attempts to root out their evil influencer once and for all. This is a ghost story which is creepy and unsettling rather than being outright terrifying, so I suppose as a horror film, for me, it wasn't a resounding success. 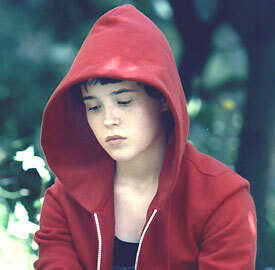 Nevertheless, it was a well acted, well made film with some haunting moments. In a way, I saw an echo of the themes of this movie in another, later British horror film, The Wicker Man. (Not the hilariously bad Nicholas Cage version... http://www.youtube.com/watch?v=e6i2WRreARo) In both films, a prim and proper outsider comes to a remote location and is horrified by what they perceive as the corruption of the innocent, by forces they do not understand. In both films, the outsider's attempts to interfere with the way things are leads to tragedy. Something to mull over, anyway. Having watched Se7en a few weeks ago, I was determined to watch David Fincher's other classic serial killer movie, Zodiac. For me, this is one of the best Hollywood films of the past few years. Unusually, for me, I hadn't read too much about the film before I saw it at the cinema, which made the scenes in which the Zodiac first attacks particularly powerful. The movie is based on the real life Zodiac murders, which took place in the late '60s and early '70s in and around San Francisco. The excellent cast includes Jake Gyllenhaal as Robert Graysmith, a cartoonist who becomes obsessed with solving the Zodiac case, Robert Downey Jr as the lead crime reporter at the San Francisco Chronicle and Mark Ruffalo as David Toschi, the lead detective investigating the Zodiac killer at the SFPD. Although a few scenes don't work quite so well when you know that the protagonist isn't in any real danger (such as Graysmith's visit to the house of the creepy projectionist), the film has a menacing quality which stays with you long after you've finished watching. It's a film which is as much about the obsessive nature of the men who pursue the case as it is about the Zodiac killings themselves. It also features an excellent soundtrack, remarkably detailed period costumes and set design and brilliant cinematography. All in all, it's brilliant. I'm going to do something I very rarely do here and award a '10'.